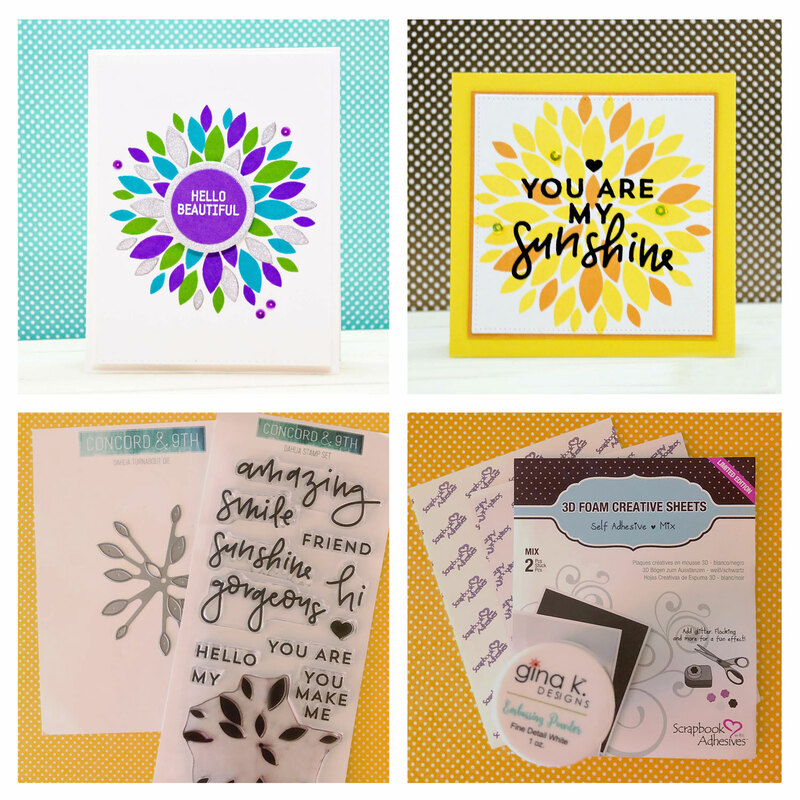 Created 4 Creativity : A Giveaway for My Blog Readers! A Giveaway for My Blog Readers! Recently I was blessed with some lovely stamps (some used), dies and supplies. And I would like to share my good fortune with you. The stamp and die above were duplicates of ones I already owned. There is some light staining on the dahlia stamp, but it is still totally perfect for stamping. I am giving away the Concord and 9th Dahlia Turnabout stamp and die, a package of 3D Foam Sheets and a jar of Gina K. Designs Fine Detail White Embossing Powder. If you would like to enter this giveaway, leave me a comment below and tell me your favorite stamp set in the whole wide world. It will be fun to read your responses. I will choose a random number Friday night at 10pm. I will announce the winner in my Saturday morning blog post. I will also announce it on Facebook...you can find me RIGHT HERE. If I pick the number that coincides with your comment, I will contact you right after I announce the winner. So please include your email address in your comment. If you are chosen, I will ask for your address and send your package to you on Monday morning. Good luck all and I'll see you again tomorrow. I just happened upon your site today. What lovely art you make! So bright & cheery. My all time favorite stamp set is one I bought when I first started stamping. A StampinUp set of long stem flowers. Makes great sympathy cards. I don't know if I have an all time favorite stamp... I am pretty obsessed with My Favorite Stamps right now .I'm loving the company and pretty much any product they put out! Your work is fantastic! I like MFT daisies and Stampin' Up. love your beautiful cards. My favorite set is Body Language by Paper Smooches because it has cute kidneys, and my husband gave our daughter a kidney 11 years ago and we celebrate Kidney Day every year and the stamps are perfect for it. The cards are beautiful! I don't think I can pick a favorite stamp set yet, as I am newer to stamping and there are many to explore still. I do love a Wonder Woman stamp I bought (Great for friendship cards) as well as a Chocolate Lover's stamp set. I would love some freebies to help grow my collection. Thank you for the chance! SU Lovely As A Tree - so kind of you to offer this giveaway. SU French Script background stamp. It’s ancient but I love it. 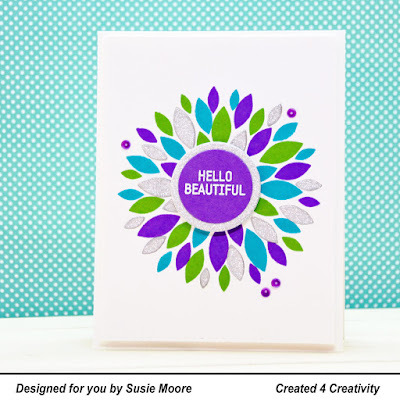 Thanks for the opportunity - I really love this dahlia stamp and die. I just love your cards. Favorite stamp set is the fill in phrases kit from Concord & 9th. First of all, THANK YOU FOR THE GIVEAWAY. Your cards are very pretty, love the colors. Have lots of favorite stamp sets but my best one is the Wolf set from Stampin Up many years ago, this was my first stamp set purchased and still you use. Second is Lovely as a Tree. THANKS again. Oh my goodness, one favorite? Right now, it's probably the Concord & 9th Wonderful Florals stamp and die set. You don't need anything else to make a gorgeous card. I love your clean style and follow you on IG. So happy I read your post so I can now follow your blog too. Looking forward to learning more from you daily. Not sure that the Lord created me to create because I am not the craftiest gal, but I am thankful for being able to try! Right now I am loving the Hero Arts monthly kits, in particular FIESTA. Thanks for chance. Beautiful cards! Thanks for the chance to win. I seem to go through phases of certain sets being my favourite. One I frequently go back to though is Lawn Fawn's Lovable Legends. It was one of the first sets I got. I am looking a the Concord and 9th Dahlia Turnabout stamp & die and thinking that could easily become my go to. I don’t have many sets, but bought the bird/boho blossoms from a lady that was downsizing. This set can be used for many occasions and it has been! 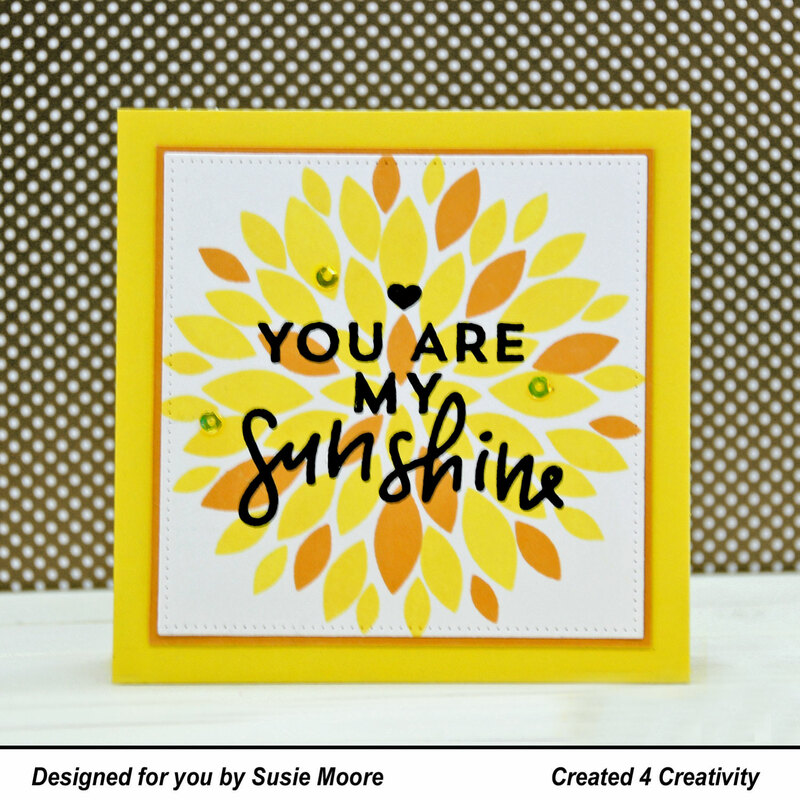 Being retired now, I am hooked on card making, and loving it. Thank you. Oh my...your cards are so fabulous! I was really loving this stamp when it was released, but I'm on a very tight budget so it was not something I could get. Thank you so very much for your generosity and kind heart. Boy, I don't know if I have a favorite. I have a TON of stamps-both wood and acrylic-and really love them all. I have recently discovered Kindred Stamps and LOVE the Game of Throne-ish ones. So much fun!! I also love, love, love anything Christmas themed. I am enjoying my Gina k wreath builder stamp....I don't really have favorite yet but I do like greetings for cards. Thank you for the opportunity to win a turnaround stamp. It looks like fun. Any set with a cat! Beautiful cards! Thanks for your generosity - what a great gift to won! I am in love with anything Whimsy stamps . They are so much fun to color! Thanks for the chance! I have seen this stamp a lot and it is beautiful. Lively cards and how kind of you to have this giveaway. I do’t have a favorite set but tend to use many different florals. Love the cards. My favorite stamp set right now is the Gina K Wreath Builder. Thanks for the chance to win. 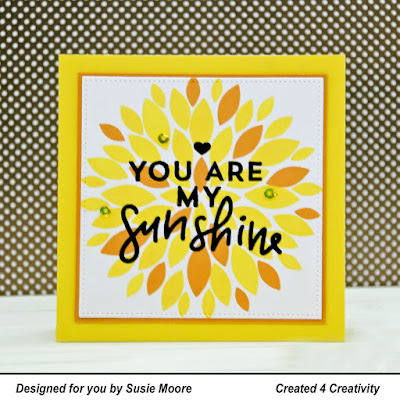 These cards are amazing, and the stamps & dies that you are generously giving away have long been at the top of my wish list!! My favorite stamp set is currently SU's High Tide--been making a lot of eclipse cards with it recently. My email address is pamstone@verizon.net. Thank you!!! My favorite stamp set is art impressions ; we are fabulous. I believe that is the name of it , I love the silly and funny ladies stamps. Hi!!! Let me introduce myself. I'm your biggest fan. #1. No contest. Sole surviver. Top Dog. You get the drill. I need this stuff so I hope the wheel of fortune falls right here! Thank you so much for the chance to win . My favorite stamp set in the whole wide world? Gosh. This is hard. I'd have to say Altenew's Beautiful Day. It's sublime. Trying to chose just one is like having to pick a favorite child!😄 but recently I have been playing with the Tim Holtz crazy birds, dogs & cats...but just got an order of unity’s Angie’s girls that I’m itching to play with! Thank so so much for the opportunity as I tried to purchase this very stamp but it was sold out at the time! Fingers crossed! My favorites are the layering flower stamp sets. Maybe my all time favorite is the Altenew Beauyiful Day set. It’s hard to choose!